This is a 2bedroom/2bathroom apartment located on the bottom floor of the villa, with superb views of the sea and mountains. The apartment, fully furnished and equipped, is situated less than half a mile from the beach, restaurants/bars and supermarket. Beautiful garden and swimming pool. Romantic area. Night life: The view from villa 'Hojas de Otoño' is of the Mediterranean sea and mountains. It is in a quiet area but the vibrant night life with clubs and discos is to be found around 5 km at Puerto Marina Harbour. Grenada, Seville...: It is quite possible to make days expeditions to Grenada, Cordoba, Seville, Gibraltar, Ronda, La Axarquía. Golf information: There are several excellent 18-hole courses very close to the area. If you are smoker you are kindly requested not to smoke inside, only open air. There are ceiling fans but for the air conditioning a supplement of 50 euros per week is required. This was our first introduction to the Costa del Sol and my wife and I spent a week here in Early June. I won't critique the locality as that's for the travel guides, but within striking distance are a fairly broad representation of everything Andalusia has to offer. The property is on an established urbanisation which is on a steep hill which makes any notion of walking to the sea or up to the local supermarket not an option for us. (we being not terribly fit late 50's and early 60's!) So a car is in my opinion essential. The kitchen has everything one could need to prepare meals, the bathrooms are good and the bed comfortable, all linen spotless, and plenty of hangers in the large wardrobes. The pool also is great. If I were to return to this region I would definitely book here again. Unlike other contributors we only met Pepe the owner briefly, however he appeared charming and helpful and I don't doubt he would respond well to any issues. The cold drinks in the fridge and a bottle of red when we arrived was a very pleasant touch and appreciated. The pool and garden where attending to every other day, so and kept immaculate. Unusually for me I can't find anything to say on how this property could be improved on - maybe new lounge cushions for the pool, but that's being really picky. I loved it here. Tim and his wife are very nice, respectful and communicative. I’ve been lucky hosting them. I met them for a very short time. They left the house very clean and took good care of it while they were here. They will be welcome if they come in the future. I wish them a lot of pleasure. Lovely views and very kind helpful hosts!. The property is in a lovely area, peaceful but very steep hill, which we managed. We took our 3 year old daughter in October - the area was very peaceful, not too many tourists, and we loved it. Definitely needed a car for those steep hills even though the beach and supermarket are not far. Lovely sea views from the terrace and the pool was still warm enough (just about) to swim! A well-equipped villa and a good size. Good choice of local shops and restaurants, and only 20 mins from airport! We loved Los Boliches for dinner options and the toddler/young children's mini fun fair a bit further down the coast road towards Fuengirola. Mijas was a nice day trip, though a bit more touristy/tacky than we were expecting - I actually thought the gift shops in Torremelinos were better/more authentic! Absolutely loved the butterfly park just up the road, and the Buddhist temple next door - made a nice day out away from the beach. Pepe was a very friendly, welcoming host. He has a real gem here! The villa is in a fantastic setting, overlooking the sea. The facilities are of a high standard and the pool is wonderful. The owner, Pepe, is a kind and gentle man who was always on hand to offer any help we needed. We didn't hire a car but did end up spending quite a lot on taxis. The villa is situated on an extremely steep hill so be warned. The wifi signal was really good, which kept my eldest child happy. No complaints at all. Would recommend to anyone looking a a peaceful and private getaway. We had a fantastic week in this beautiful villa. The area is lovely, the property itself has everything you need and Pepe is the perfect host. Highlights include the pool, the beach and the local villages. Our 7 year old son had a great time, it felt like a home away from home and I highly recommend it. Thank you Pepe for sharing your wonderful home with us. Lovely clean house, garden and pool with everything you require in the kitchen and elsewhere for a homely stay. 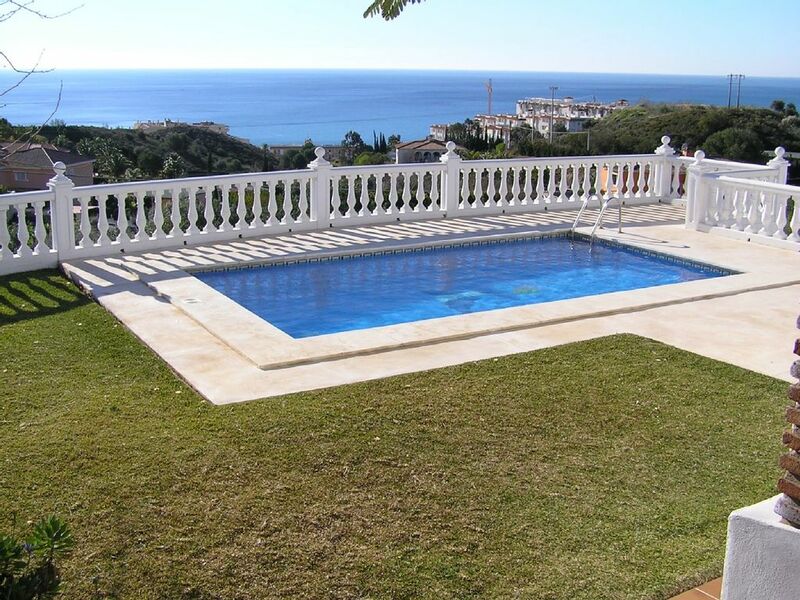 Roomy house and veranda set in well maintained gardens with panoramic view of the surrounding are and the sea. Benalmadena Stupa is a 30 minute walk away and well worth a visit, and on the way you can visit Aldi for supplies. Only down side is the steep walk back from the beach so not good for people with mobility issues. The owner Pepe is very nice and helpful and lives in the apartment above which can be very useful if you require information. I'm sure I'll be going back a third time soon ! It is a delightful holiday villa for all year round sun worshippers, golfers and tennis players. The villa is located in a very quiet area. Near the beach. For rent the apartment 'LUNA LLENA' at our villa. All costs are included except Air Conditioning.There are ceiling fans in each room; but if you want air conditioning the price is increased in 60 euros a week. Christmas, New Year's Eve and Easter rates on application. Deposit 50% of total rental. Change over day is SATURDAY. Flexible in winter. Arrival time is after 3 pm and clients must vacate by 11 am on departure day. Please, e-mail to place a provisional booking before arranging flights. Provisional bookings are held for 24 hours only.